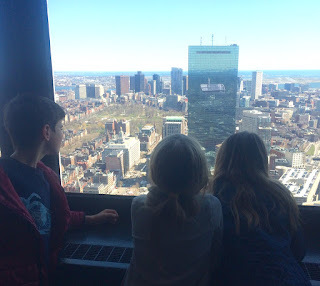 If you asked my son his favorite part of being in Boston last week, he’d tell you it was looking out on the city from the top of a tall, tall building. That, or the 14 firetrucks surrounding our hotel, lights flashing, as we stood outside in our pajamas with other guests while firefighters extinguished a small fire on our floor. These are things that just don’t happen in Franconia, and we filled our three days in Boston with experiences we’re unlikely to have at home. What I have always loved about traveling – whether to a nearby city or a foreign land – and what my children are learning, is that visiting other places bridges the divide between the familiar and the exotic. Both – familiar and exotic – are, of course, relative perspectives, altered by time and knowledge and new experiences. My children think nothing of being able to run out the door into lots of space for playing and exploring, or of gazing at a gazillion stars in a night sky unhindered by light pollution, or of riding their bikes down the middle of our sparsely traveled road. But to these small-town kids – and their mom – everything about the city seems exotic: the tall buildings, the subway, the stoplights and constant buzz of traffic, the people moving everywhere. The first time we took the kids to Boston they were preschoolers. They stood in the window of our hotel room with palms and noses pressed against the glass, peering down at the busy streets and sidewalks several stories below. We were only a couple of hours from home, but for all the wonder of country kids in a big city, we may as well have been on the moon. Now that we’ve been to Boston together a few times, there are favorite city places my kids like to revisit. This trip we hit the Aquarium and meandered through Boston Common to the Public Garden to see the Make Way for Ducklings statues. We rode the T, an underground adventure complete with escalators and weird subway smells. We wandered the crowded food stalls of Quincy Market, searching for lunch, and marveled at all the offerings: pizza, sushi, chimichangas, chowder, lo mein, nan, lobster rolls, gelato – a virtual world tour of tastes in one building. We ventured on new explorations, too, walking the length of Newbury Street (so many shops!) from the Public Garden to the Prudential Tower, where we took the elevator to the 50th floor. From our bird’s eye view, we studied the city laid out far below: the Common where we’d just been, the Charles River, Fenway Park, the blue and yellow finish line of the Boston Marathon painted across Boylston Street and awaiting the runners who would cross it in a few days. Even from that height it was easy to see the history woven into the city’s concrete cloth. The past is everywhere, of course, but in Boston it is on plain display, tucked conspicuously into nooks and corners throughout the city. Our first night in town we walked by the Old State House, a 300-year-old brick structure surrounded now by towering glass buildings. From its balcony, the Declaration of Independence was read two weeks after its signing in 1776. The narrow brick pathway of the Freedom Trail ran along the sidewalk by our hotel, on either side passing ancient cemeteries containing the remains of such historic giants as Paul Revere, John Hancock, and Sam Adams. There are statues rising from squares and plazas all around the city, and historic interpreters dressed in Colonial garb regaling onlookers with tales from Boston’s Revolutionary past. Around all of it, the modern city buzzes with activity and myriad new experiences there for the having. During this city fix, the kids took their first taxi ride, complete with the sudden stop-and-go of city driving. And they saw their first big show – The Wizard of Oz (a journey of a different sort) – in a real theater. After three days packed with sights and sounds, tastes and smells, new experiences and lots of pavement walking, we returned home, tired and filled with thoughts of all the things we’d seen and done. We settled back into our familiar space, the sounds of cheery robins and spring peepers replacing the steady, noisy hum of traffic, the view now of clouds drifting across craggy mountains rather than tall buildings. Original content by Meghan McCarthy McPhaul, posted to her Blog: Writings From a Full Life. This essay also appears as Meghan's Close to Home column in the April 22, 2016 edition of the Littleton Record. They both looked a little forlorn at bedtime Sunday: my daughter all the way upstairs, a full story above the rest of us; my son tucked into bed in his usual place, but without the company of his twin sister across the room they’d shared since they were toddlers and had to vacate the nursery to make way for their baby sister. We’ve been talking about separate bedrooms for months, and with our weekends free for the first time since Thanksgiving, we spent most of Saturday making the long-awaited switch. We muscled unwieldy furniture through narrow doorways and along stairways and tight hallways. There were beds to take apart and move and reassemble, heaping piles of clothes to relocate, and dust bunnies to sweep from the hidden corners where they’d long been hiding. With all the heaviest lifting done, it was fun to watch the kids expand into their own spaces, arranging and rearranging toys and trinkets, putting things wherever they wanted without the potential of invoking a sibling-roommate’s ire. Once my daughter was moved out of the shared bedroom and into her bright and solo realm upstairs, my son had an entire room to himself to organize. No more shared closet and dresser, plenty of space for spreading out the toys normally stuffed under his bed, a place for his saxophone and books. Sharing a small bedroom had become harder the older and bigger the children grew, and the more assertive of their own individuality. There were arguments over whose mess needed picking up, who was standing in the way of the dresser when it was time to put laundry away, and who was just too invasive of the other’s personal space. Along with the inevitable squabbling, however, there were also sweet moments of room sharing: the summer mornings when I’d find all three kids reading quietly together in one room or another, the happy playing of made-up games, the secret conversations in the dark when they were supposed to be asleep. This move – like so many moments in the parenting saga – inspired mixed feelings for me. Even as I try to encourage my children to grow and find their own place in the world – OK, in this instance just their own place in our house – I find myself often inwardly begging them to stop growing up so darned fast! I want to nurture their growing independence and confidence, but at the same time I lament that I am, ever so slowly, moving further from the center of their lives. This is what my mother would call giving children both roots and wings: roots so they will be secure in knowing where they come from (and where they can always return); wings so they are free to explore as they will, to find their own direction. It is a constant parental balancing act to locate that happy place between the root planting and the wing building. My children are not babies anymore. This is no surprise to anyone, of course. But I am regularly shocked to notice how big they are, how much they are growing all the time. It seems both ages ago and yet not so long past that there were two tiny babies snugged into a crib next to our bed, then the nursery across the hall, then one more room down to make way for another baby. Now the three of them are spread throughout the house, testing their wings just a little bit, even as their roots grow strong. Saturday, the day of the big move, the kids were so excited about all the newness of the room shift, the novelty of all that extra personal space. Still, the older two decided to have a sleepover in my daughter’s new room. Despite their newfound liberation, it seemed, they were not quite ready to give each other up. They needed one more night in the same room. One more night of talking past lights-out, of waking up and knowing they were not alone. Sunday they looked a bit forlorn at bedtime, but that could have just been a sentimental mother’s perception. My son had a great book to read and was soon contentedly lost within its pages. My daughter had all that space to enjoy and no brother to tell her when to turn out the light. Now, a few days in, everyone seems perfectly content. We’d been talking about the move for months, and I know it was time. But I’ll miss the sound of their small voices floating down the stairs in the post-bedtime darkness – still the voices of children, still near enough for me to hold, still together – now that they’re in rooms of their own. Original content by Meghan McCarthy McPhaul, posted to her Blog: Writings From a Full Life. This essay also appears as Meghan's Close to Home column in the April 8, 2016 edition of the Littleton Record.